President Pervez Musharraf today tightened his grip on Pakistan’s nuclear arsenal by issuing an ordinance that made him the head of the National Command Authority which is responsible for development and control of atomic weapons. Malaysia invoked a tough internal-security law today to indefinitely detain five ethnic Indian activists from a group that had staged a mass anti-government protest last month. Iran today said that its latest round of talks with the UN nuclear watchdog to resolve outstanding issues about its disputed atomic work were a positive step, the semi-official Mehr news agency reported. 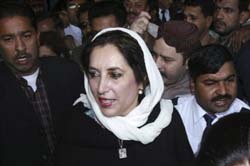 In an apparent bid to keep the heat on PPP chairperson Benazir Bhutto, attorney-general Qayyum Malik has ruled out constitutional protection to the National Reconciliation Ordinance (NRO) that pardoned corruption cases against her. Amid speculations about a predetermined outcome of elections, President Pervez Musharraf has trashed the voices casting doubts on the fairness of January 8 elections, terming them as an attempt to pre-empt possible poor performance. Nusa Dua, December 13 Millions more people will be at risk from illnesses such as malaria and diarrhoea in a warming world beset by heatwaves and water shortages, the World Health Organisation said on Thursday. People of Indian origin who move to Scotland soon contract heart diseases because they are quick to adopt the bad lifestyle habits of local Scots, such as poor diet, according to new research. The Bangladesh Supreme Court today overruled a high court order that had stayed the trial of former Prime Minister Sheikh Hasina in an extortion case at a make-shift court. Bangladesh has sought nearly $1.8 billion from the international community as post-cyclone emergency aid for reconstruction and rehabilitation works as well as long-term prevention and adaptation measures. A jury has awarded $2.5 million in damages to a woman who received HIV treatments for almost nine years before discovering she never actually had the virus that causes AIDS. At least seven persons were killed and 12 others injured today when two suicide bombers blew themselves up near a security check post close to the southwestern Pakistani city of Quetta. Mortars slammed into the biggest market in Mogadishu today, killing at least 12 people hours after a government official said radical Muslims had regrouped and were poised to launch a massive attack. More than half the babies born to British mothers this year will be outside marriage for the first time since records began, while for Indians the corresponding figure will only be 20 per cent. The ordinance, issued late in the night, gives a more structured character to the NCA, which was originally set up in February, 2000, to address concerns about the safety of the nuclear arsenal. Under the original set-up, the chief of the NCA was the “head of the government” or the Prime Minister. The ordinance issued by Musharraf names the President as the chairman of the NCA and the prime minister as the deputy chairman. The order said: “It is necessary and expedient to establish an authority for complete command and control over research, development, production and use of nuclear and space technologies”. It also provides for the “safety and security of all personnel, facilities, information, installations or organisations and other activities or matters connected” to nuclear and space technologies. Pakistan President Pervez Musharraf today finalised the order that would revoke the state of emergency on December 15, a key demand of the international community. Before the emergency is ended on Saturday, the constitution will be amended to give protection to all actions taken by Musharraf since he imposed the measure on November 3. The changes will not affect the jurisdiction of the judiciary, attorney general Malik Qayyum told reporters. All fundamental rights will be restored with the revocation of emergency. All chief justices and judges of the apex court, federal Shariat court and four provincial high courts will have to take an oath under the constitution after the withdrawal of the emergency, he said. There is no move to introduce a fixed term for the chief justices of the supreme court and high courts and no change is being made to constitutional provisions related to the Supreme Judicial Council, the body responsible for the accountability of judges of superior courts, Qayyum said. A police official, who declined to be named, said the five belonged to the Hindu Rights Action Force (Hindraf), which had stunned the government by bringing more than 10,000 ethnic Indians onto the streets to complain of racial discrimination. One of those detained was a Hindraf leader, lawyer P. Uthayakumar, who has already been charged with sedition for alleging that Malaysia practised “ethnic cleansing” of Indians. “They said they were arresting him under the ISA (Internal Security Act), but they didn’t say where they were taking him,” said Shantha, who answered Uthayakumar’s mobile phone after the news of the detentions and said she was his secretary. She gave the names of three other detainees as M. Manoharan, V. Ganapatirau and T. Vasanthakumar. She said she was not aware of a fifth detainee, though Hindraf’s website gave the fifth name as K. Kengadharan, a lawyer. Prime Minister Abdullah Ahmad Badawi, who came to power four years ago promising more transparent and open government, had said this week he would have no trouble signing a detention order to ensure public security and national stability. A separate crowd of around 10,000 persons had earlier turned out on the streets of the capital to demand fairer elections, amid expectations of a snap poll by March 2008. But the Indian rally, though largely peaceful, aroused deep concerns within the government, and also among many Malaysians, because of the country’s history of tense and sometimes explosively violent race relations. A source in the Special Branch said today that Hindraf’s protests and allegations of ethnic cleansing at the hands of a Malay-dominated government had angered many Malays, who all were Muslims. The police was keeping a close watch on Malay activists and mosques, the source said. This is a multiracial country and it takes little to upset the balance,” said the source, who declined to be named. But the opposition has accused the government of using the spectre of racial violence as an excuse to crack down on the peaceful dissent, noting that police was enforcing a blanket ban on all forms of anti-government protest, regardless of the issue. “We condemn these arrests,” said Liam Guano Eng, head of the opposition Democratic Action Party. Experts from the two sides started three days of talks on Monday under a deal reached in August between the International Atomic Energy Agency (IAEA) and Iran to remove concerns about the country’s nuclear work, which the West says is a cover to build bombs. Iran says it seeks only nuclear power. “Talks were held in a completely constructive atmosphere and this is another positive step by Iran ... to resolve the remaining issues,” Mehr quoted Ali Asghar Soltanieh, Iran’s envoy to the IAEA, as saying. Soltanieh said the result of talks would be announced by the IAEA after “it finishes all the necessary evaluations”. Under the pact, Iran is to answer outstanding questions about its nuclear activities one by one. The latest round of talks focused on questions about particles of arms-grade enriched uranium found by the IAEA inspectors at Teheran’s Technical University. “At these meetings, answers to the agency’s technical questions regarding the issue of the source of contamination were given,” Soltanieh told the official IRNA news agency. The UN Security Council has imposed two rounds of limited sanctions on Iran since last December over Teheran’s failure to heed a UN demand to halt uranium enrichment. The United States and Western allies want further measures. Enriched uranium can be used both for fuelling power plants and, if desired, for making bombs. Malik, who held two long sessions with President Musharraf on Wednesday and Thursday for preparation of the proclamation order to end emergency, dispelled speculation that the constitutional amendments being announced before lifting the emergency would include protection to the NRO. In an observation last week, Malik had expressed the opinion that the Supreme Court would throw the NRO out as unconstitutional. The ordinance was enacted as a result of a deal between Bhutto and Musharraf under which Bhutto facilitated Musharraf’s election on October 6 in return for the NRO, which provided a blanket indemnity to her and several of her party leaders. Additionally, it led to the withdrawal of criminal cases against several activists of Musharraf’s staunch ally, the Muttahida Qaumi Movement (MQM). The Supreme Court under the now deposed Chief Justice Iftikhar Chaudhry had stayed implementation of any decision under the NRO till its legality was determined in a case, interestingly filed on the behalf of Nawaz Sharif’s brother Shahbaz Sharif. A constitutional amendment to give legal cover to all the actions taken under different proclamations and subsequent orders since November 3. He emphatically reaffirmed his resolve to ensure that the elections would be free, fair and transparent, adding that apprehensions of rigging are unfounded. “No one should have any doubt that the elections would be above any taint,” Musharraf said during a chat with a small group of journalists at the farewell dinner he hosted at the Aiwane Sadr for his chief of staff and troubleshooter, Lt-Gen Hamid Javed, who would leave the office on December 15. Though Musharraf has decided to continue to reside in the Army House, Rawalpindi, meant for the army chief despite retiring from the army after assuming presidential office as a civilian, he would have a military secretary instead of a chief of staff. The president said all parties had been provided a level playing field and it was up to each party to ensure to do sufficient groundwork to enter the contest. Shujaat Hussain claimed that the PML-Q would perform well in Punjab and other areas. Musharraf shrugged his shoulders when pointed out that the PPP of Benazir Bhutto would secure over 90 seats, according to the secret reports sent to him. He reportedly told his aides that he expects the PPP to win about 40 seats and almost the same number for the PML-N of another former Prime Minister Nawaz Sharif. Daily Dawn reporting from London cited intelligence estimates as giving the PML-Q 115 seats followed by PPP (90), MMA (45), PML-N (40), MQM (20) and ANP (12) in a House of 342. Now minus the Jamaat-i-Islami, which is boycotting the elections, the religious grouping, led by Maulana Fazlur Rehman, is likely to retun at least two dozen seats, less than what it got in 2002. In a hung House, however, it will still hold the balance in the formation of coalition government. The paper quoted unnamed sources as saying that the official plan was to rig the poll in such a way as to deny a clear majority to any of the contesting parties so as to place President Pervez Musharraf, in a position of cobbling together a coalition of his choice which, according to the American script, is a coalition of the PML-Q and the PPP. The paper further speculated that in view of the likely stalemate in the formation of a viable government after elections, the January 8 elections might be invalidated and Musharraf would call for fresh poll in June. Millions more people will be at risk from illnesses such as malaria and diarrhoea in a warming world beset by heatwaves and water shortages, the World Health Organisation said on Thursday. Climate experts say rising temperatures and heatwaves will increase the number of heat-related deaths, while higher ozone levels from pollution will mean more people suffering from cardio-respiratory disease. A warming world would also mean the spread of vector-borne and pathogenic diseases such as malaria, dengue fever and cholera. “Some of the major killers are climate sensitive,” Maria Neira, the World Health Organisation’s director for public health and the environment, said at climate talks in Bali. “We are concerned about malnutrition related to lack of agricultural production, we are concerned about diarrhoea due to water scarcity and sanitation, and about seeing an increase in dengue and malaria and their appearance in areas where it was not present,” she said. Neira told the climate talks on the Indonesian resort island of Bali that a 1 degree celsius increase in temperature would lead to an 8 percent increase in the incidence of diarrhoea. Climate change was also expected to increase the proportion of the global population exposed to dengue, a disease carried by mosquitoes, by between 50 and 60 percent. A study by Edinburgh University and NHS National Services Scotland has suggested that people of Indian, Pakistani and Chinese origin adopt the bad lifestyle habits of Scots when they go to live there. But the same was not true of English people living in Scotland. They had a 20 per cent lower chance of dying from heart disease than those born there. The researchers said more needed to be done to explain the differences. Colin Fischbacher, a public health medicine consultant, and his colleagues studied the death certificates of Scottish residents aged over 25 who died between 1997 and 2003. The results, published in the Scottish Medical Journal, showed English men living in Scotland had a 25 per cent lower death rate than Scottish-born residents, and a 22 per cent lower death rate from heart disease. Among women, heart deaths were 20 per cent lower. But the same was not true of Asians in Scotland. Fischbacher said people from India and China typically had a low risk of developing heart disease or stroke. Fischbacher said it was deeply alarming that Scots of Asian origin, especially those from India and Pakistan, were now displaying equally high rates of cardiovascular disease as those in the country in which they now live. He said the trend might be because immigrants assume the more negative aspects of the unhealthy Scottish lifestyle. He said that the statistics on Scots of Asian origin will now be used to help deliver more targeted health care for the community in order to reduce heart disease levels. The high court last Sunday had stayed the trial proceedings in a 3-crore taka extortion case against Sheikh Hasina, following a writ petition filed by her. The high court had also issued a rule upon the military-backed government to explain why the holding of the trial of Hasina and two others at a make-shift court should not be declared “without lawful authority”. In the wake of the high court order, trial court judge Azizul Haque today postponed the trial proceedings against the former Prime Minister for the next three months until March 8, 2008. Meanwhile, the appellate division headed by Chief Justice M. Ruhul Amin stayed the high court order clearing the holding of trial at the make-shift court in the high-secured parliament building complex where Hasina has been kept detained in a make-shift jail since July 16 this year. “We have sought the amount in the light of the appeal made by the chief adviser (Fakhruddin Ahmed). The development partners will make their own assessment and consider how to provide necessary assistance,” Economic Relations Division (ERD) secretary Aminul Islam Bhuiyan was quoted by ‘The New Age’ newspaper as saying. The blasts occurred at the check post at Kuch More area within Quetta cantonment, 12 kms from the capital of Balochistan province. Apart from the two suicide attackers, three military personnel and four civilians died in the blasts. "This is the first time there was a suicide attack in this part of the city," said military spokesman Maj Gen Waheed Arshad. The injured were taken to a nearby military hospital. All roads leading to the cantonment were closed as investigators cordoned off the site of the blasts to search for evidence. More than 40 people were wounded in the attack on the Somalian capital and the death toll was expected to rise. “I saw so many dead people lying on the road, I couldn’t even look at them, I was so scared for my life,” said Salah Garweyne, a Mogadishu resident. At least 40 wounded people were taken to Medina Hospital, and two died on arrival, said Dr Hassan Osman Isse. 19 were in critical condition. According to the Office for National Statistics, when Indians, Pakistanis and other New Commonwealth parents are stripped out of the figures, births outside marriage in the UK are projected to rise above 50 per cent for the first time in 2007. In 1970, one in 10 children was born outside marriage and in the 1950s just one in 20. This followed a steady decline in marriage among British couples that began in the 1970s. On the other hand, nearly all births to Pakistani mothers and more than 80 per cent to Indian and other New Commonwealth parents are within wedlock.